The immunogen is derived from isoform alpha-E, UniProt accession P02671-1, and the antibody is not expected to detect isoform alpha. within Human Fibrinogen alpha chain aa 750-850. The exact sequence is proprietary. The immunogen is derived from isoform alpha-E, UniProt accession P02671-1, and the antibody is not expected to detect isoform alpha. Mouse: We have preliminary internal testing data to indicate this antibody may not react with this species. Please contact us for more information. Our Abpromise guarantee covers the use of ab92572 in the following tested applications. WB 1/1000 - 1/10000. Predicted molecular weight: 95 kDa. Antigen retrieval plus the use of an HRP/AP polymerized secondary antibody is highly recommended for enhanced staining. The band around 35 kD represents FGA fragment (PMID: 24937656). Immunohistochemical analysis of paraffin-embedded mouse placenta using ab92572 at 1/1000 dilution (0.5 μg/ml). Heat mediated antigen retrieval with Tris-EDTA buffer (pH 9.0, epitope retrieval solution 2) for 20mins. 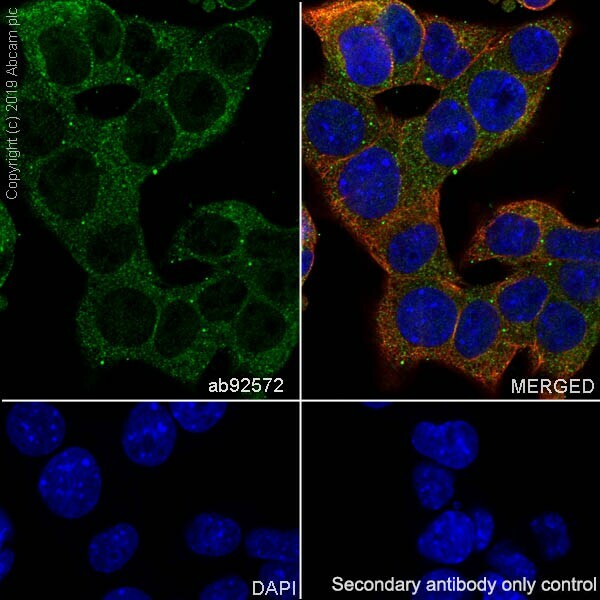 A rabbit specific IHC polymer detection kit HRP/DAB (ab209101) was used as a secondary antibody (ready to use). Negative control used only the secondary antibody. Counterstained with haematoxylin. Positive staining in plasma of mouse placenta. The section was incubated with ab92572 for 30 mins at RT. The immunostaining was performed on a Leica Biosystems BOND® RX instrument. Immunocytochemistry/ Immunofluorescence analysis of Hepa1-6 (mouse hepatoma epithelial cell) labeling Fibrinogen alpha chain with ab92572 at a dilution of 1/250. Confocal image showing cytoplasmic staining in Hepa1-6 cells. 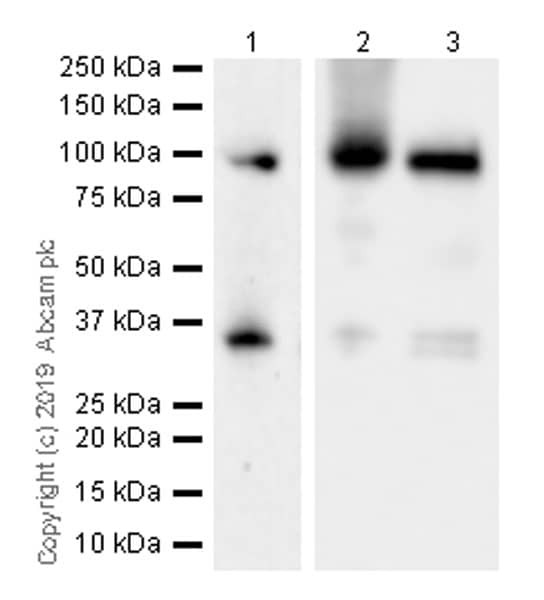 ab150077 AlexaFluor®488 Goat anti-Rabbit at 1/1000 dilution was used a secondary antibody. Cells were fixed with 4% Paraformaldehyde and permeabilised with 0.1% TritonX-100. ab195889, Anti-alpha Tubulin antibody [DM1A] - Microtubule Marker (Alexa Fluor® 594) at 1/200 was used as counterstain and nuclei were stained with DAPI (blue). Immunohistochemical analysis of paraffin-embedded mouse lung using ab92572 at 1/1000 dilution (0.5 μg/ml). 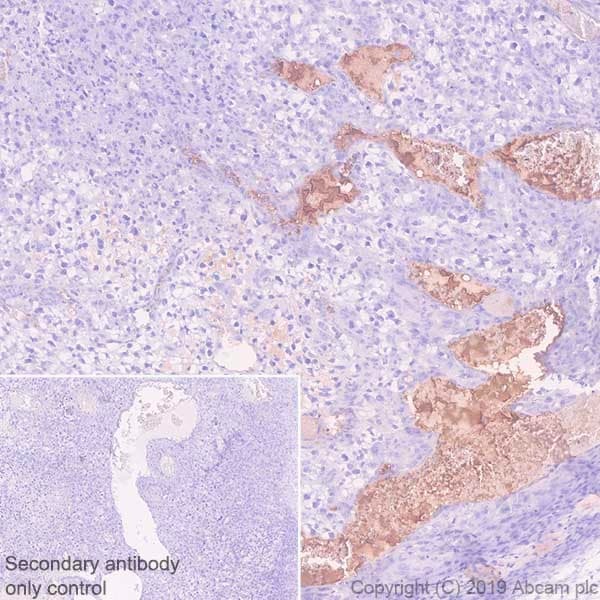 Heat mediated antigen retrieval with Tris-EDTA buffer (pH 9.0, epitope retrieval solution 2) for 20mins, a rabbit specific IHC polymer detection kit HRP/DAB (ab209101) was used as a secondary antibody (ready to use). Negative control used only the secondary antibody. Counterstained with haematoxylin. Strong positive staining in plasma of mouse lung (PMID: 26259584). Flow Cytometry analysis of Hepa1-6 (Mouse hepatoma epithelial cell) labeling Fibrinogen alpha chain with ab92572 at 1/50 (red). 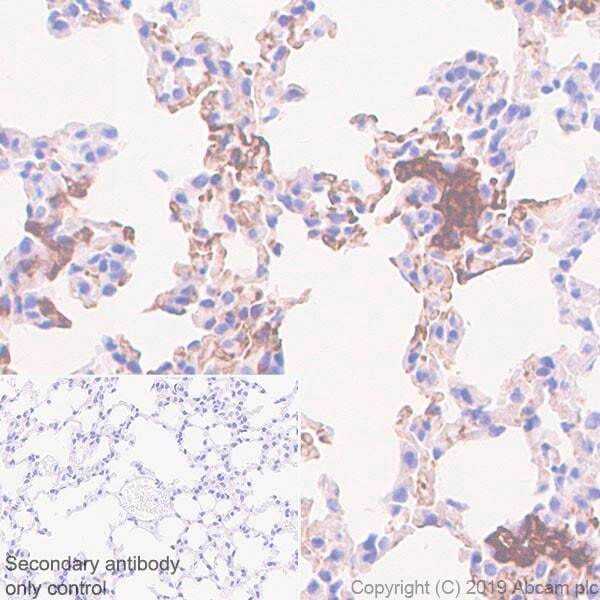 Goat anti rabbit IgG (Alexa Fluor® 488), ab150077 at 1/2000 was used as the secondary antibody. Cells were fixed with 4% paraformaldehyde and permeabilised with 90% methanol. Isotype control / colour Rabbit monoclonal IgG (ab172730) (black). Unlabelled control / colour Cell without incubation with primary antibody and secondary antibody (blue). Immunocytochemistry/ Immunofluorescence analysis of HepG2 (human hepatocellular carcinoma epithelial cell) labeling Fibrinogen alpha chain with ab92572 at a dilution of 1/250. Confocal image showing cytoplasmic staining in HepG2 cells. ab150077 AlexaFluor®488 Goat anti-Rabbit at 1/1000 dilution was used a secondary antibody. Cells were fixed with 4% Paraformaldehyde and permeabilised with 0.1% TritonX-100. ab195889, Anti-alpha Tubulin antibody [DM1A] - Microtubule Marker (Alexa Fluor® 594) at 1/200 was used as counterstain and nuclei were stained with DAPI (blue). 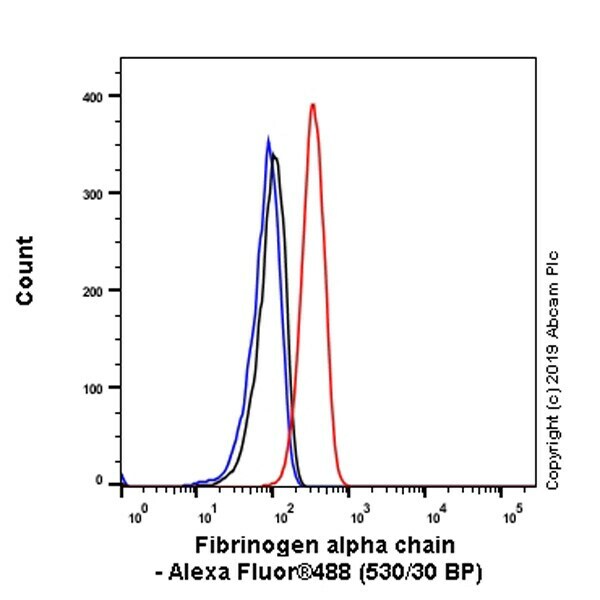 ab92572 at a dilution of 1/100 immunoprecipitating Fibrinogen alpha chain in human plasma. Lane 2 (+): ab92572 + human plasma. Lane 3 (-): Rabbit monoclonal IgG (ab172730) instead of ab92572 in human plasma. For western blotting, ab92572 was used as the primary antibody at a 1/1000 dilution and ab131366 VeriBlot for IP (HRP) was used as the secondary antibody (1/5000). Immunohistochemical analysis of paraffin-embedded human hepatocellular carcinoma using ab92572 at 1/2000 dilution. Publishing research using ab92572? Please let us know so that we can cite the reference in this datasheet. Was the immunogen used to make this antibody a 15 or 16 aa peptide corresponding to the sequence of the fibrinopeptide A molecule? The immunogen sequence used to generate ab92572 is a short peptide found with Fibrinogen alpha chain. It does not specifically detect the Fibrinopeptide A molecule. Does this product detect the main protein Fibronogen and/or Fibronogen-cleaved proteins? Does this product detect Fibrinopeptide A that has NOT been cleaved from Fibrinogen alpha chain? Thank you for your enquiry. The immunogen contains Fibrinogen alpha chain and is in the Fibrinogen C-terminal region. This antibody detects the main protein Fibrinogen. If Fibrinopeptide A has not been cleaved from Fibrinogen alpha chain, then the antibody is expected to detect Fibrinopeptide A, since it would be part of the existing pro form.